PolyCharge is Best Multi Recharge Software in India With Some Innovative. Our Multi Recharge Servers ensures 100% uptime gurantee; with a recorded response time of 1 Minute during the peak business hours. The system has been developed after a constant research by a dedicated team of engineers ensuring that the system has easy to understand user interface and can be customized easily as per the business needs and demands with minimal human interference. In this modern era online system is the most powerful tools for recharge, If you are connected with online then you can easily avail our recharge facility with smart way. Our association is broadly known for maintaining the quality in offering Mobile Recharge System. 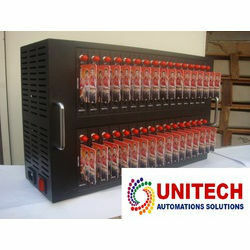 We are leading in manufacturing and supplier of 16PORT Prepaid Mobile Recharge Systems in Chennai, Tamilnadu, India. We are leading in manufacturing and supplier of Automatic Prepaid Mobile Recharge Systems in Chennai, Tamilnadu, India. Recharge the system using the appropriate refrigerant to the exact system capacity according to the vehicle manufacturer's specifications.